Kissing Disease XL 10" under a microscope! And really perfect for people who actually have Mono! FACTS: The Kissing Disease, or mononucleosis, is caused by the Epstein-Barr virus (named after its discovers Michael Epstein and Y. M. Barr.) More than 95% of the population is infected! Most people catch the virus at a very young age, at which time the symptoms are often too mild to be noticed. However, those who catch it when they are young adults (or older) suffer from sore throats, swollen lymph glands, and extreme malaise. In addition, the spleen can become enlarged – sports and strenuous activities must be avoided to prevent rupture. Epstein-Barr virus also causes an increase in the level of "mononuclear" white blood cells in the blood, which is how the disease got its nickname. Nevertheless, Epstein-Barr is not very contagious. Transmission requires close contact such as kissing or sharing drinks. And with an incubation period of 4-7 weeks, it can be a while before you know whether you’ve caught it. Most people get over Epstein-Barr in a couple of weeks – though it can take up to a year to kiss the virus goodbye! 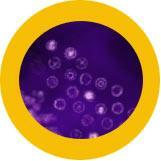 All about Kissing Disease XL 10"
• Approximately 3 million cases appear in the U.S. annually. • 35 to 50% of adolescents and young adults develop symptoms of mono after being infected with the virus, including a significant amount of college students. 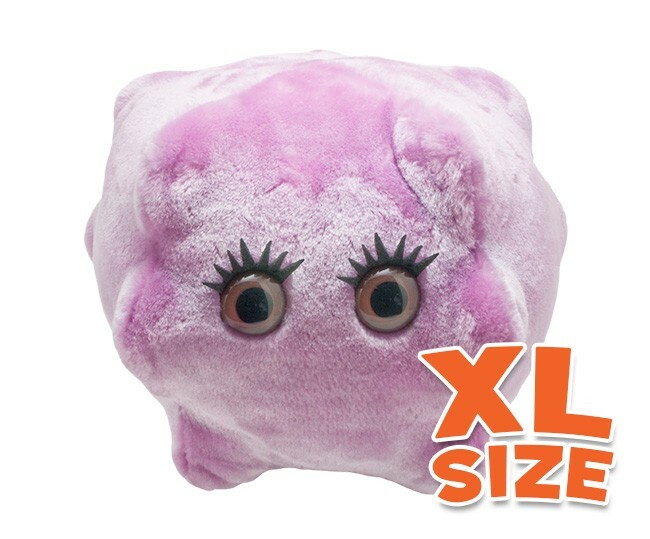 • Send your college friend/significant other our microbe as a great gag gift! !